At a moment in time in American culture when debate rages over what is real and what is “fake news,” Mystic Seaport Museum brings back to the limelight a controversy from more than 50 years ago that rocked the scientific, historical, and cultural realms of U.S. society. 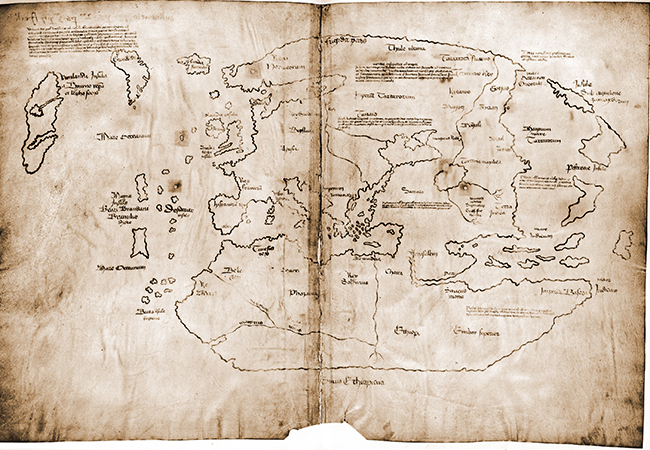 Science, Myth & Mystery: The Vinland Map Saga, which opened May 19, explores the stories around and behind the publication in 1965 of a scholarly examination of a piece of parchment known as the Vinland Map. One must-do this summer is to visit the exhibit, The Vikings Begin: Treasures from Uppsala University, Sweden. The artifacts have traveled from Scandinavia’s first university to Mystic Seaport Museum in Connecticut to highlight how Viking culture evolved and the span of its influence. It includes artifacts dating back from the seventh century, many of which are leaving the university for the first time. It is divided into “thematic sections on Viking warfare, trade, the Baltic Sea, a ship burial, Norse gods, and relations to other cultures.” After Mystic Seaport, the exhibit will be touring other locations in the U.S. I am especially excited to see the section on the Baltic Sea. I have visited Viking displays and exhibits throughout Europe: England, Scotland, Norway, Denmark, and Sweden, as well as in New York, and I have never seen this subject discussed. In the middle of the Baltic lies the Danish Island of Bornholm, where my maternal great-grandfather was born. A beautiful place that I had the privilege of exploring once. I later read that it had been a trading post for the cultures around the area, including the Sámi. Yet, on my visit, there was no hint of this history. As a bonus, Mystic Seaport Museum also has a second complementary exhibit, Science, Myth & Mystery: The Vinland Map Saga. This map, part of Yale University’s Beinecke Rare Book and Manuscript Library collection, had not been on display for 50 years. What a wonderful pairing, as the publication of this map in 1965 set the long-held belief that Columbus was the first European to come to the New World into a tailspin, supplanting it with the fact that Scandinavians were here 500 years prior to Columbus’s arrival. This exhibit also includes results of more recent technology used to authenticate the map. Helge and Anne Ingstad’s 1964 discovery of the Norse settlement believed to be Vinland substantiated the legitimacy of the Vinland map. Their work is included in the exhibit. I had the opportunity to speak with Daniel McFadden, Director of Communications at Mystic Seaport Museum, about the Viking exhibits. 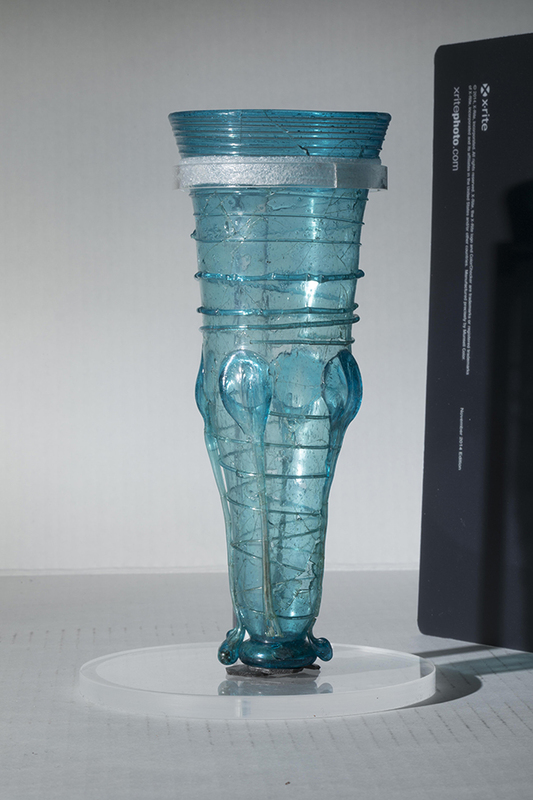 Part of The Vikings Begin: Treasures from Uppsala University, Sweden, this glass beaker, made from glass with gold ornamentation, dates to the seventh century. Victoria Hofmo: What is unique about the exhibit Mystic Seaport is hosting? Daniel McFadden: The Vikings Begin exhibition is unique in that it displays some of the oldest Viking artifacts ever unearthed, artifacts that have been known for many decades, but only recently have scholars been able to go back and reexamine them with the perspective of the latest research and knowledge. As a result, the artifacts tell us quite a bit more about who the early Vikings really were. VH: How were you able to pair this with the Vinland Map display? DM: Pairing the two exhibitions together was more the result of fortuitous timing rather than design. Around the time we were in discussions with the Gustavianum Museum about their possible exhibition, we approached Yale University about collaborating on an exhibit about the Vinland Map. As both discussions moved along, it became obvious that we could do both exhibitions at the same time and the Viking connection seemed an effective way to leverage public interest for both. DM: The Vinland Map story is all about what comprises historic evidence and what one deems to be “true.” In an era of “fake news” where what used to be considered settled facts are now called into question, the map controversy shows that this conversation is not new. The Italian-American and Nordic-American communities were engaged in a heated debate over First Contact in America based on a few details in the corner the Vinland Map. Its questionable provenance only exacerbated the conflict even though available archeological evidence from Newfoundland showed the Vikings had made it across the Atlantic hundreds of years before Columbus. VH: It must be exciting to be the site where this exhibit debuts. Where else will it go? DM: We are very excited to be the first stop on the exhibition’s international tour. This is the first time any of these artifacts have crossed the Atlantic and we are honored to be the first museum to display them. After Mystic Seaport Museum, the exhibition will move to the Nordic Museum in Seattle and then the American-Swedish Institute in Minneapolis. VH: When the exhibit tours, will it include the Vinland Map exhibit as well? DM: No, the Vinland Map exhibition will not tour with The Vikings Begin. The map will be returned to the Beinecke Rare Book & Manuscript Library at Yale. Mystic Seaport Museum’s display will be the only opportunity to see the map and exhibition. DM: Public response to the exhibition has been very positive. Visitors are excited to see the artifacts and very impressed by their beauty and intricacy. They dispel a common conception of Vikings as being nothing more than coarse raiders and that is exactly what we want the exhibition to do: show people who the real Vikings were. Experiencing the combination of these two exhibits is truly a once-in-a-lifetime experience. Both exhibits are on view through September 30. Mystic Seaport Museum is located at 75 Greenmanville Ave. in Mystic, Connecticut. For further info, call (860) 572-0711 or email info@mysticseaport.org. On Sunday, July 29, author James L. Nelson “will discuss the fascinating history of Viking raiding, settling, and assimilation into Irish culture” at Mystic Seaport Museum. This will be followed by a performance of Celtic-inspired music by the American Rogues.